The 423 verses in the collection known as The Dhammapada (pada: "the way"; dhamma: "the teaching"; hence, "The Path of Truth") are attributed to the Buddha himself and form the essence of the ethics of Buddhist philosophy. 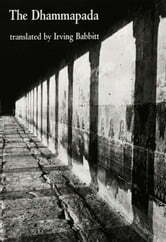 There are a number of English translations of The Dhammapada, but this version by Irving Babbitt, for many years professor at Harvard and founder, with Paul Elmer More, of the movement known as "New Humanism," concentrates on the profound poetic quality of the verses and conveys, perhaps more than any other, much of the vitality of the original Pali text. Babbitt devoted many years to this translation––it was a labor of love. Together with his essay on "Buddha and the Occident," which is also included in this edition, The Dhammapada was one of the basic components of his view of world history, a view which has influenced leaders of thought as diverse as Newton Arvin, Walter Lippmann, David Riesman and T. S. Eliot. Eliot, indeed, once wrote that "to have been a student of Babbitt's is to remain always in that position."